The study analyzed the aggregate staging for each of the five categories of e-readiness indicators as well as data for each university. Detailed results for each of the 30 universities that participated in the survey were posted in the e-readiness survey results database and are available to authorized users of in universities. 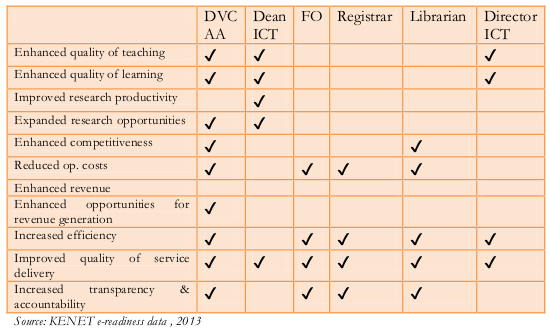 The universities could use the results as part of monitoring and evaluation of their ICT or corporate strategic plans, or for regular review of their strategic plans. The results could also be used for benchmarking among participating universities (i.e., University of Nairobi could compare their results with Kenyatta University with permission). The following figure summarizes the overall results of the 2008 and 2013 surveys. It is evident that in the five years between the surveys, there has been limited accession to higher stages for most of the 17 indicators. In fact, only two indicators, namely, ICT in the workplace and network environment had moved to stage 3.0 and above by 2013 while the other 15 indicators remained below stage 3.0. However, the Internet availability indicator moved from stage 1.6 to stage 2.9 in 2013 mainly due to the increase by a factor of 10 in the Internet bandwidth per 1,000 students sub-indicator. In general, the results suggest that accession to higher stages has been slow since the universities were not able to achieve stage 3 for 15 out of the 17 indicators. A similar conclusion was reached by the 2008 survey which demonstrated that accession required the commitment of the academic, administrative and ICT strategic leadership. This study analyzed the aggregate staging for each of the five categories of the e-readiness indicators. Detailed results for each of the 30 universities that participated in the survey have been posted on the e-readiness survey results database and are available to authorized users of the universities. The universities could use the results as part of monitoring and evaluation of their ICT or corporate strategic plans, or for regular review of strategic plans.